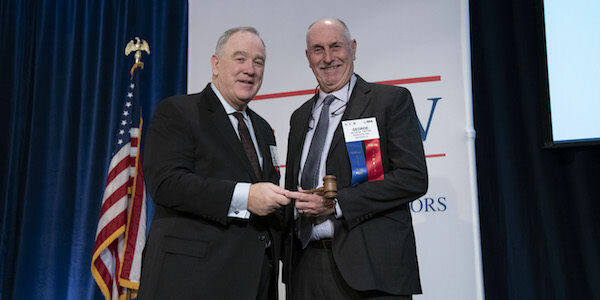 George Pattee, chairman of the board of Parksite Inc., receives the NAW 2019 Chairman’s Gavel from Joseph C. Nettemeyer, president and CEO of Valin Corporation. Washington, DC — Members of the National Association of Wholesaler- Distributors (NAW), during the association’s Executive Summit in Washington, DC, elected as chairman of the NAW Board of Directors, George Pattee, chairman of the board of Parksite Inc., headquartered in Batavia, Ill.
Pattee succeeds Joseph C. Nettemeyer, president and CEO of Valin Corporation, headquartered in San Jose, Calif. Nettemeyer will remain active on the NAW board as immediate past chairman. “On behalf of the 650 employee-owners of Parksite, I am honored to serve as the 2019 Chairman of NAW. After receiving the benefits of NAW membership for almost 25 years, it’s my time to give back to the organization that has helped Parksite grow and achieve its goals. Over all these years, our team has benefited greatly from the networking and benchmarking opportunities, educational events, best practice thought leadership, and business services that NAW offers. I’ve also developed wonderful business connections with other distributors through NAW. I look forward to working with this association and our members in 2019 and contributing to NAW’s ongoing important work for our industry,” said Pattee.